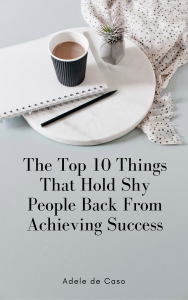 Are you shy or an introvert…….or both? Home / Blog / Are you shy or an introvert…….or both? To say my life is busy and varied right now is an understatement! However I am feeling very happy and content. We have recently moved back to the UK for a while after living there for just over 3 years. We will still be visiting regularly though. I really like the fact that we move from one to the other quite a bit as both the UK and Spain then remain a novelty. I will miss my morning dog walks along the beach, but there are really nice things about the UK to replace those for a while. We have been looking at schools and colleges. It’s been a bit of a learning experience to say the least. I have also being doing lots of research into something called ‘unschooling’ (homeschool without a curriculum) and I am really drawn towards it as I feel there is lots that we can teach children without them being in the classroom. I am actually having a practice week this week with my youngest and he has already won two games of Monopoly and a game of Scrabble! We will be finalising decisions on all this as a family very soon. Introversion – preferring your own company or the company of just a few people rather than being in large groups. So, for example, I would prefer to have several small dinner parties with a few guests than throw one big party with lots of guests. At the party I would feel uncomfortable, shy and anxious, but if just a few of the same guests were attending a dinner party at my house, I would not feel any of these things. So, my shyness can appear in large groups still, but in small groups I am ok. And the fact that I prefer small groups would suggest that I am an introvert. I recently came across a lady named Morra Aarons-Mele, she has written a book called ‘Hiding In The Bathroom’. I have read some of her blog posts, she has managed to build a successful business with a huge network, but she talks about her anxieties and how she doesn’t like to leave the house if she doesn’t have to. She also points out that a lot of the successful entrepreneurs she has interviewed are not the outgoing, always on it superstars that we imagine. Reading about her ‘hiding in the bathroom’ reminded me of the days when I used to sit in my car on the carpark when I got to work until the very last possible moment. And I love how she has learnt to embrace her anxiety just like me with my shyness. She says….. The last thing I want to mention is my new ideas journal. I am currently attempting to write down 10 ideas each day suggested by James Altucher. Most days I don’t manage 10, but even so it’s a great exercise. I love it, it really gets the creative juices flowing. James says that if you can write down new ideas each day you really start to stretch your ‘idea muscle’ which in time will serve you massively. As you probably know, I love journals and any reason I can find to write in a new one is just fantastic! Anyway, that’s all for now, see you very soon! This entry was posted in Blog, Uncategorized and tagged Confidence, introversion, introvert, Shyness, success formula. Bookmark the permalink. ← Travelling, personal development and a new puppy!